The scenario of a “subtle moisture surge over a relatively cold Northern Rockies” appears to replay again and again over the next week, with chances of light snow present nearly every day during this time. The impacts of the snowfall will mostly be to create hazardous winter driving conditions. Temperatures are anticipated to moderate over time, however very slowly. We are essentially stuck in a cold pattern that shows no sign of letting up in the next week and beyond. I am at the mercy of the snow plow man. I shovel my way up the stone steps to see if he has plowed our road or not. Actually, the time I spend shoveling the steps and the walkway is the best part of being stuck in winter’s deep, even if I need the heating pad on my low back the next morning. It feels so wild out there. The kitties usually stay in the garage on their heating pad, and I am alone. Often, I hear an eagle–once I saw one fly overhead with a fish in his talons– and there is a little tiny brown bird, about the size of a black-cap chickadee, who appears with a few of his mates, and flits from tree to tree, knocking down a small cascade of snow from the branches. I see where the skinny legs of deer have trudged through the woods across the deep snow. An occasional gust of wind sends down a white-out shower through the trees with a whooshing sound that always startles me. 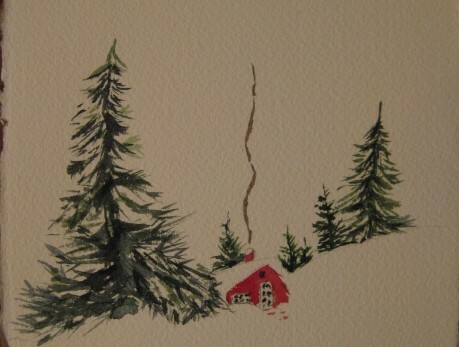 There is no longer a path in the snow down to the lake, and Don continues to carve out a space in the snow bank, left by the plow, so he can make his way down to the house with a wheelbarrow full of split wood. I wonder how many more times he will fill the porch before winter ever loses its grip. We’re off to Spokane later today for one of Don’s ski races. Any Montanan who has crossed into Idaho over Lookout Pass in the winter, knows it’s not for the faint of heart. (Where is the emoji face of panic when I need it?!). And, alas, winter’s deep will still be here when we return on Monday. I’m already looking forward to this big sheltering roof, at the bottom of snow-covered stone steps, welcoming me back to my snug house, a warm fire next to all those books, and dreams of seeing dirt some day. foot drift and dug it out. At first we could not open doors. The post office shut for two days. Our road had vanished into a field. the wild green of grass islands. splendid in its ordinary shining. overcome on the field of battle. This entry was posted in Uncategorized on February 9, 2019 by rebsuebauder.